Make perfectly portioned desserts when you bake a batch of Carrot Cake Minis. 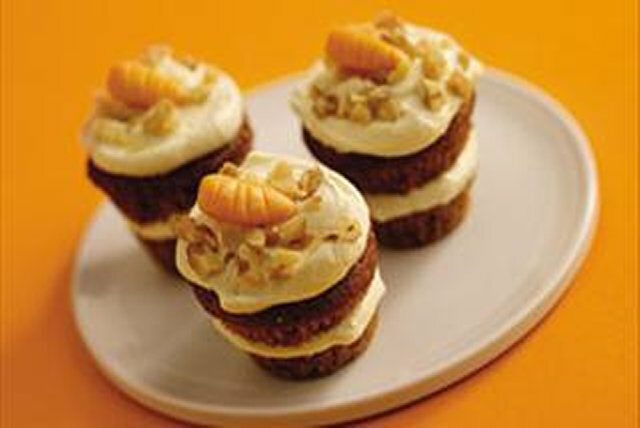 Carrot Cake Minis are great for gatherings or as an on-the-go treat whenever and wherever you'd like something sweet! Prepare cake batter as directed on package. Blend in dry pudding mix. Spoon into 48 paper-lined mini muffin cups. Bake 12 to 15 min. or until toothpick inserted in centers comes out clean. Cool cupcakes in pans 10 min. Remove to wire racks; cool completely. Meanwhile, press candies until softened; roll up each to resemble carrot. Spoon frosting into medium bowl. Add COOL WHIP; whisk until blended. Remove cupcakes from liners; cut horizontally in half. Fill each with about 1 Tbsp. COOL WHIP mixture. Top with remaining COOL WHIP mixture, nuts and carrot candies. Use some of the cupcakes to make cupcake push pops. Cut 12 cooled cupcakes horizontally in half. Place bottom half of cupcake in each of 12 push pop containers; cover with 1 Tbsp. COOL WHP mixture and top half of cupcake. Top each with 1 Tbsp. of the remaining COOL WHIP mixture, 1/2 tsp. nuts and 1 candy carrot. If candies are too firm to roll up, microwave them on HIGH 4 or 5 sec. or just until softened before using as directed.